To keep you all in context, I just had Roscoe's House of Chicken & Waffles the day before I first tried Bruxie's. That weekend I just had a sudden waffle craving so I decided to try Bruxie's since the one in Downtown Brea had just opened not too long ago. After I had Bruxie's for about 2-3 weekends straight, I even bought a box of Eggo's to ease my waffle cravings during the weekdays. 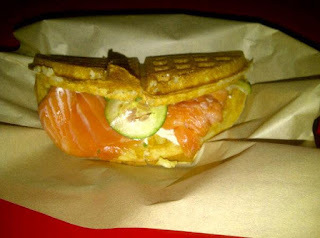 I'm a big fan of anything salmon, so when I heard about Bruxie's Prosciutto and Gruyere Smoked Salmon & Dill Cream Cheese, I just had to try it of course! Boy was it delicious, the portion of smoked salmon was just right and the amount of cream cheese spread was perfect. The waffle carried all these wonderful ingredients masterfully with a golden brown crisp taste at every bite. All of this comes at a price tag of $7.95, not too shabby for the O.C. right? There are many other options for the regular sandwich categories such as pastrami or chicken, but for those with a sweet tooth you might also want to try Bruxie's sweeter sandwiches. I believe everyone I've influenced to go to Bruxie's has taken my Seasonal Fruit Creme Brulee recommendation with much appreciation. 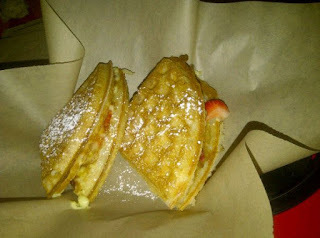 The Bruxie Creme Brulee Sandwich is absolutely delicious whether you were a creme brulee fan to start with or not. The sandwich is filled with creme brulee and fresh strawberries, all lightly topped with powdered sugar. This all comes to a grand total of $6.50. If you're not into smoked salmon or creme brulee, don't worry because Bruxie's offers a wide selection of different tastes you're sure to fall in love with. Additionally, there are different specials everyday and seasonal sandwiches as well! Now I don't like to overhype these trending food places because that's just not me, but I've been convincing a whole bunch of people to go their recently and they've been coming back to satisfy their Bruxie cravings. I know Bruxies didn't invent the "what can we do with a waffle" trend but (almost like Apple), they definitely reinvented the way I think of waffles.